Undertaking a work placement in the UK is a great way to impress future employers and gives you excellent first-hand experience of the working world. The Erasmus programme was created and supported by The European Commission as the part of Lifelong Learning Programme, and enables university students to undertake work placements that are related to their profession in the UK. Erasmus Work Placement students (from Croatia and Turkey) are eligible to do 20 hours part time work during the program as long as it is part-time work related to the student’s main subject in the program. The Erasmus and Erasmus + Work Placement program is a once-in-a-lifetime opportunity for students and lasts between 3 and 12 months. Students can start the program at any time of the year. InterCon UK arrange work placements for students. 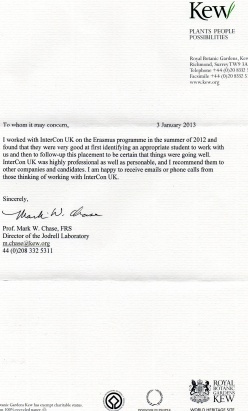 InterCon UK also helps students with the Training Agreement filled by their Employer. Please Note: It is recommended that students should give InterCon UK, at least 5 weeks placement time after the registration process. Note: Fast work placements are avalaible in Hospitality field. InterCon UK offers various options for students who wish to study English while doing their Erasmus Work Placement in the UK. Please contact us for further information. InterCon UK will find accommodation for students who undertake their work placement in Bournemouth. For the rest of the UK, InterCon UK will advise students how to find accommodation. The majority of students in the UK rent a room in a house with 4-5 rooms. These houses are normally privately-owned and are rented on a shared basis. Normally the kitchen and bathroom are shared with the other house mates. The weekly rent is between approximately £75 & £100.This depends on the location and the season. For shared rooms the rent normally starts from £60. The cost of accommodation may be more expensive in London. The weekly rent normally includes a furnished room and utility bills. In most places internet use is also included in the rent. Most landlords or agencies request 2-4 weeks’ rent as a deposit and give the deposit back when the student leaves. The cost of food must be paid by the student. InterCon UK is looking for a Erasmus Work Placement student who would like have a work experience at business administration, marketing and public relations. The role is for immediate start and preferably min. 6 months. This page has been updated on 16. January 2019 15:08.